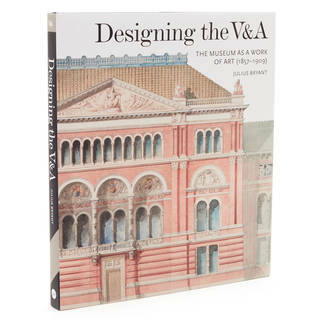 A meeting point, resting place and home to a changing display of outdoor installations, the John Madejski Garden is known to many as the heart of the V&A. 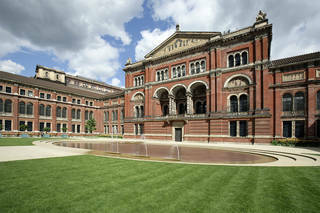 In its early days, a wide expanse of garden surrounded the South Kensington Museum, as the V&A was known before 1899. 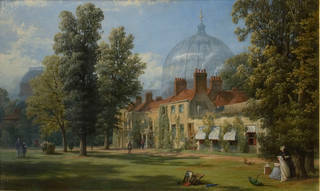 The lawns and trees belonged to the original house on the site, Brompton Park House, at one time the home of Queen Anne's gardener, Henry Wise. These gardens were gradually built over as the Museum expanded and today the enclosed garden courtyard, formed between 1857 and 1909, is a small reminder of the gardens which once filled most of the neighbourhood that we now know as South Kensington. The concept of a quadrangle was not part of the initial plan for the Museum. 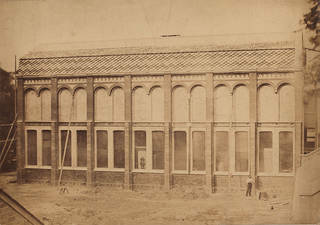 When it opened in 1857, just one permanent building, a paintings gallery, had been erected on the east side of the garden. A block including staff residences followed in 1863 on the west side, and then the grand building intended to be the main entrance to the north two years later. It was intended that this u-shaped arrangement would remain open to the south, with the entrance visible from Cromwell Road, but in the end the fourth side was filled in with an art library, completed in 1884 to enclose the courtyard. Viewing the buildings around the garden, visitors are treated to a wealth of decorative ornamentation – including terracotta modelling, mosaic and tiles – on each of the buildings' façades. The Museum's founding Director, Henry Cole, employed a team of decorative designers to apply painting, sculpture, mosaic and elaborate ironwork to the buildings, so that their exteriors were as beautiful and as instructive as the collections within them. 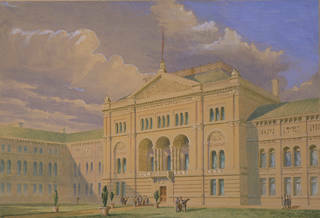 The grand building to the north, sometimes known as the Lecture Theatre Block, was intended as the public's first introduction to the Museum. It contained the Refreshment Rooms, galleries for the ceramics collections, access to the art and science schools and of course a lecture theatre. The imposing height of the original entrance is thanks to the vision of Cole and Captain Francis Fowke, a military engineer who was the building's principal architect. In turn, the decoration of the façade proclaims the Museum's founding aims and its devotion to education and design. The mosaic in the triangular pediment at the top of the building commemorates the Museum's origins: Queen Victoria stands before the Crystal Palace at the Great Exhibition of 1851 and hands out laurels. On the left, Science and Invention are represented by a steam locomotive and a printing press, while on the right, the Arts are symbolised by a bust, a palette, brushes and canvas, a classical column and a violin. These mosaics, devised by Godfrey Sykes, the Museum's Chief Decorative Designer, were executed in 1868 by a major pottery factory of the day, Minton, Hollins & Co., and the mosaic class of the National Art Training School at South Kensington. 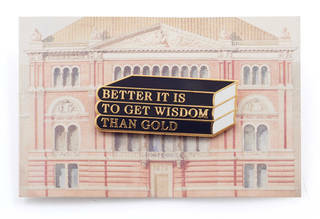 Below, the bronze entrance doors sit beneath the maxim 'Better is it to get wisdom than gold', an allusion to one of the Museum's principle aims: education. 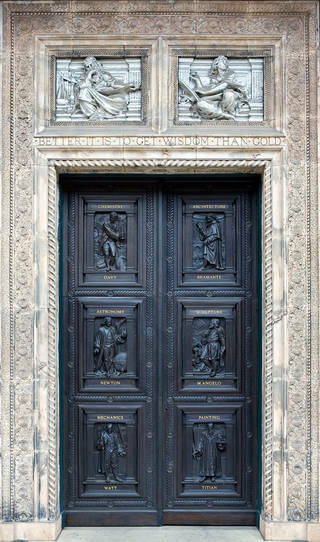 Three figures from the history of science on the left door (Humphry Davy, Isaac Newton and James Watt) are balanced by three from the arts on the right (Bramante, Michelangelo and Titian). The doors were electrotyped (a technique of copying a mould rather than casting molten metal), then given two coats of gold leaf and varnished. 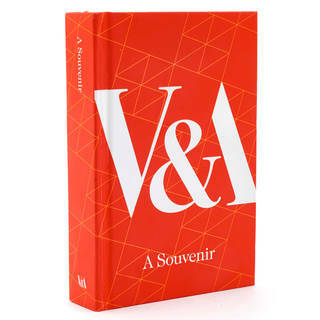 They were modelled by James Gamble and Reuben Townroe after designs by Godfrey Sykes. 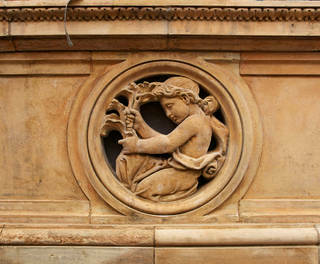 Other sculptural details on the façades of the buildings are not carved but are modelled in terracotta. A clay-based ceramic, terracota could be easily moulded by hand or by tools, was more cost-effective and quicker to carve than other materials such as stone or marble. Reusable moulds were used to produce many identical pieces, which saved money as each piece of sculpture or tile could be repeated many times using the same mould. The moulds for the terracotta columns above the entrance, for instance, were reused for the façade of the Henry Cole Wing on Exhibition Road. To the west of the Lecture Theatre block is the building once known as the Residences, which originally had galleries on the ground floor and staff residences above. Director Henry Cole moved into one of the central apartments in July 1863 with his wife, five children and four servants. A census in 1871 records 37 people living in the four official residences, out of a total of 60 people actually living in the South Kensington Museum. The Residences Block set the style for subsequent buildings, in what was sometimes referred to as the 'Lombardic Gothic' – or more simply 'Italianate' – manner. Along with the cast terracotta columns, the Residences Block is studded with figures of dancing children or 'putti' harvesting with baskets and cornucopia, pruning and sweeping and hanging garlands. The symbolism of the putti is not immediately apparent. They may have been added to emphasise the semi-rural setting of the Museum in the 1860s or they may have been re-created from Godfrey Sykes' previous undertaking – the decoration of the Royal Horticultural Society’s gardens on what is now the site of Imperial College. To the east stands the Sheepshanks Gallery, the oldest surviving building in the V&A. The Sheepshanks Gallery was designed by Francis Fowke and erected in 1856 – 7 by the Royal Engineers to house modern British paintings. 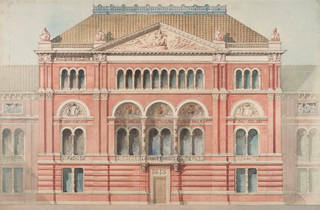 Its façade, however, was demolished by Aston Webb around 1901, when the building was realigned, given a third storey and extended. The decoration of Webb's replacement façade copied the terracotta reliefs of the Residences opposite. The final, southern side of the garden, built by Fowke's successor Henry Scott, contains galleries and, above them, the National Art Library. From the garden, the interior of the two-storey library can be seen. 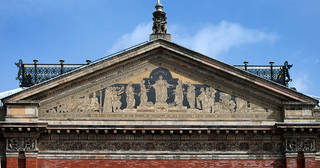 Fifteen mosaic panels representing scientific and artistic subjects such as Engineering, Mining, Steel Smelting, Building, Fine Arts, Drawing and Astronomy, form a frieze above the library windows. 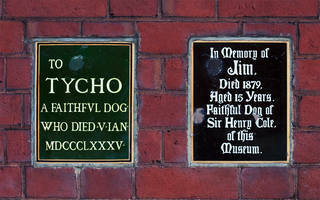 In the corner, two small plaques set into the wall commemorate Henry Cole's Yorkshire terrier Jim, and another 'faithful dog' Tycho, who were buried in this garden. According to Cole's diary, "Jimmy our little dog died of Asthma & Cold. Nearly 16 years old". Tycho's ownership, however, remained a mystery until researchers found a reference, again in Cole's diary, to Cole's son Alan. Tycho, it turns out, was Alan's pet. The modern-day garden was designed in 2005 by landscape architect Kim Wilkie. The stepped, elliptical pool and water feature provide a serene reflection of the surrounding buildings while the lawn and planters impart a tranquil backdrop to the array of temporary outdoor displays. The design is based on the traditional simplicity of a garden courtyard with the drama and flexibility of a stage set. The garden is named in honour of John Madejski, who funded the project. The V&A John Madejski Garden, designed by Kim Wilkie, 2015.